Ever thought about playing roller derby, reffing, or volunteering? Iron Range Maidens’ Registration Night is Tuesday, February 13 from 6:30-7:30 at Robert J. Elkington Middle School in Grand Rapids. See our Facebook event page for details. Can’t make it? No problem! Email us at info@ironrangemaidens.com or send us a message through Facebook. Party with the Iron Range Maidens at the Grand Rapids Moose Lodge on April 1 from 4pm until close. There will be a taco bar, bake sale, silent auction, split the pot, raffle drawings and dancing! Your support will help us keep our ticket prices low and off-set the cost of practice space. Show your support for the Grand Rapids Moose Lodge by attending their fundraiser on Saturday, March 25. The Iron Range Maidens finished out the 2016 season on October 1st at the Hodgins-Berardo arena. The bout against Bemidji’s Babe City Rollers was full of hard hits and good plays. The score at halftime was 46 to 52 Babe City. Playing aggressive offense for their jammer seemed to be the key for Babe City to keep the lead and ultimately win with a final score of 86 to 121. The Maidens opened the season with a win against Babe City in Bemidji. They also defeated SCAR and Roller Underground for a final season record of 3 wins and 1 loss. The Iron Range Attackonites (IRM’s B Team) returned for one bout this season to debut our new and returning skaters. Martyr Maker and Mcbruiser have returned to the team. Gore Mae and The Fuzz made their debut as well. The league as a whole continues to grow with new skaters, refs and returning skaters. With more members the team is planning to expand their 2017 schedule to include more bouts. They are also actively seeking an affordable space to practice in during the hockey season when ice is on the rink. (Suggestions welcome – info@ironrangemaidens.com) It is hard to grow new skaters and keep skaters in shape when there is limited practice space. A few groups and people were highlighted this season by the Maidens. The bout beneficiaries were Itasca County D.A.R.E. and Star of the North Humane Society. These groups received proceeds from “Chuck-a-Duck”. The team also honored their photographer, Wes Bailey and Jacob Wetterling. Many Maidens and skaters across the state have “Team Wes” on their helmets. This was to support Wes as he was fighting an aggressive brain tumor; a battle he sadly lost this fall. His presence on the track as a photographer and off the track as a good friend will be greatly missed. The Maidens also sported a number 11 on their calves for Jacob Wetterling. The 11 things for Jacob are: be fair, be kind, be understanding, be honest, be thankful, be a good sport, be a good friend, be joyful, be generous, be gentle with others, be positive. As always the Maidens want to thank everyone involved; from spectators, volunteers, and sponsors to skaters, refs, and NSOs. It was another great, injury free season. Be sure to follow the Maidens on Facebook! 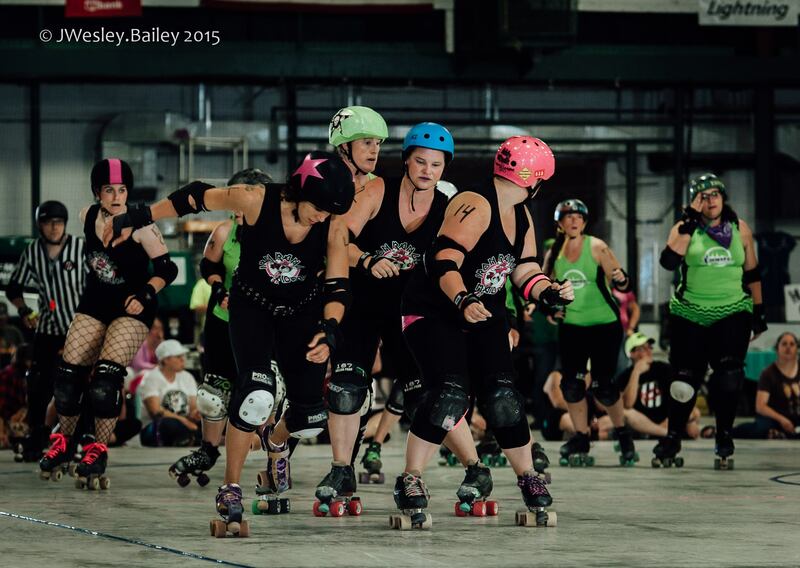 The Iron Range Maidens hit the road on Saturday the 9th to play Bemidji’s Babe City Rollers. The bout was very physical, hard hitting and fast paced. Both teams showed their strength and endurance with short rosters of Bemidji’s 9 skaters and the Maiden’s 10 skaters. There were multiple lead changes throughout the bout, but in the end, the Maidens were victorious by a final score of 162 to 139. 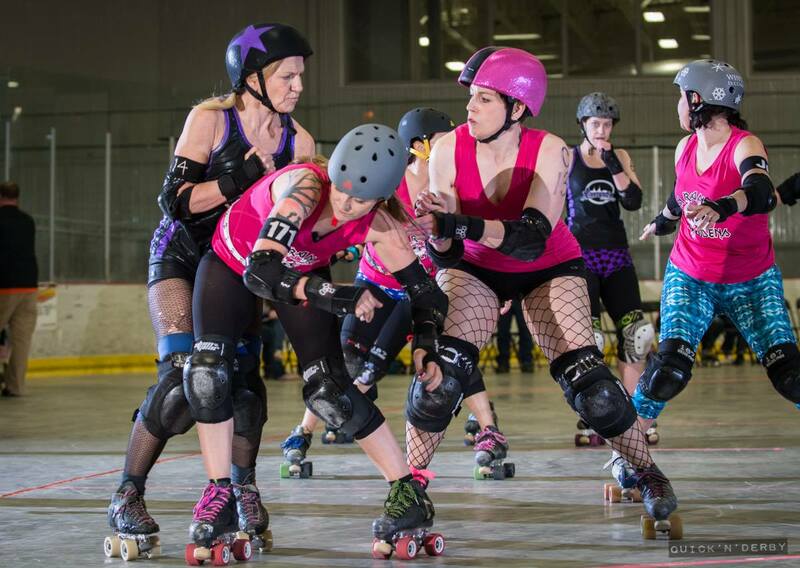 The 2016 season is shaping up to be a great year for local roller derby. With two wins under their belt, the Maidens aren’t slowing down. On May 14th the Hodgins-Berardo Arena doors will open at 5:30pm to bring you the Maidens home opener against St. Cloud’s SCAR Dolls. Tickets are $5 with ages 5 and under free. See the event page on Facebook for details. Follow the Iron Range Maidens on Facebook and support your local roller derby team and come watch a great sport. 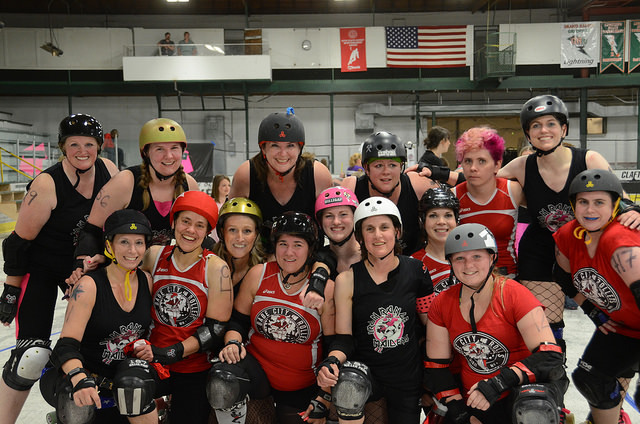 The Iron Range Maidens opened the 2016 bouting season on February 27 versus the Harbor City Roller Dames Shipwreckers in Duluth. It was a hard fought bout, but the Maidens came out on top by the score of 178 to 125. 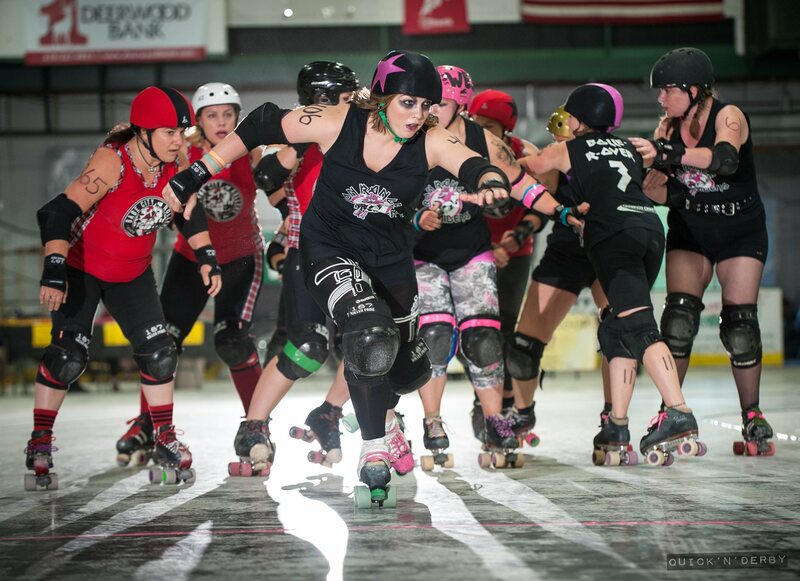 Next up for the Maidens is a bout against their neighbors to the west, the Babe City Rollers, on April 9 in Bemidji. See the event Facebook page for details. The Maidens open their home season on May 14 against the SCAR Dolls of St. Cloud at Hodgins-Berardo Arena in Coleraine. For the most up-to-date bout info, see the event Facebook page. For more on the Maiden’s 2016 season, click here. The Iron Range Maidens closed out their 5th season on October 3rd. The season finale did not disappoint. 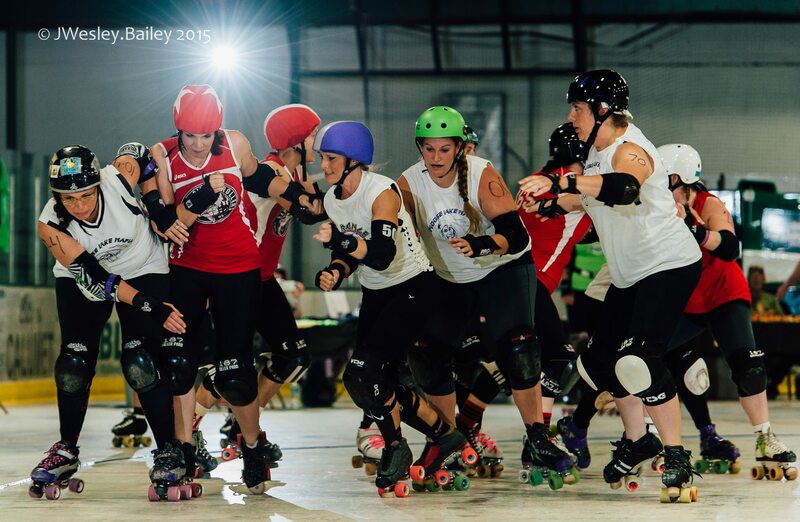 The maidens were victorious against the Mankato Area Derby Girls. The final score was 198 to 89. MAD Girls brought hard hits and high spirits, but it wasn’t enough to defeat the Maidens. The 2015 season was a great one for the Maidens for many reasons. They finished out the year with 3 wins and 1 loss. The Maidens also placed 4th at a tournament in Grand Forks. Besides wins and losses, 2015 was another injury free year for the Maidens. Lastly the team is growing with old skaters returning and new skaters coming in. In the past few months 12 women have shown interest in joining the team. The Maidens are always taking new people with any skating ability. If you find yourself curious about roller derby: want to watch or want to play, find the Iron Range Maidens on Facebook or email them at info@ironrangemaidens.com. Be on the lookout for their 2016 season where they hope to see many new skaters making their debut. The Iron Range Maidens would like to thank their sponsors for supporting them through the 2015 season: The Grand Rapids Eagles Club, Globe Drug, Grand Rapids State Bank, Ice Cube, KAXE, KOZY/KMFY, KQ, LMNO P-ZA, Northern Lights School, Northern Pines, Ogles Market Place, Paul Bunyan, Rapids Printing, Roller Derby Radio Network, Visit Grand Rapids, and Wine Creations. The season would also not be possible without their fans, volunteers, NSOs, and refs; to them the Maidens are also grateful. They hope to see you all next season! 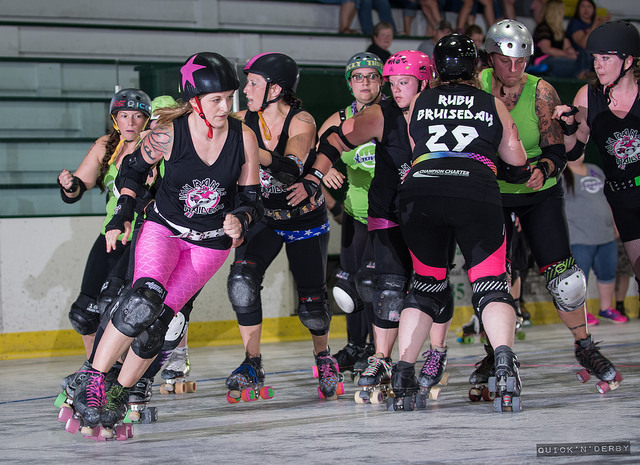 The Iron Range Maidens hosted a surprise double header on Saturday August 29th at the Hodgins-Berardo Arena. The night started off with Bemidji’s Babe City Rollers taking on Moose Lake Mafia. A final score of 139 to 108 gave the Babes the win. Moose Lake put up a good fight with the help of some foster skaters from Harbor City Roller Dames. The Babes continue to show off their endurance and amazing team work with a short roster of only 9 skaters. Fine Day Fury and Hot Flash Gordon made their debut with the Babes. The Maidens were excited to give the crowd of 200 people a win. Aberdeen, South Dakota’s A-Town brought their A game with a small roster of only 9 skaters as well, but it wasn’t enough to beat the Maidens. The final score was 189 to 90. 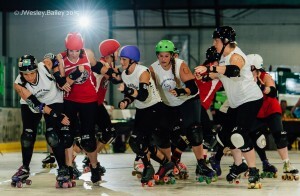 Back in May A-Town battled with the Maidens at Rumble in the Valley Roller Derby Tournament in Grand Forks. In a 20 minute bout the maidens pulled out a win by only 3 points. The anticipation of playing a full bout against A-Town drove the maidens to practice harder and work on strategies. Peanut Slugger-N-Jam, Addy Tude, and Miz D Meanor did not disappoint in their first bout back after a personal sabbatical. Winter is Coming made her debut as a true Maiden. If you are interested in skating, helping out, or just staying in loop with what the team is doing, you can follow the Maidens on Facebook or email info@ironrangemaidens.com. 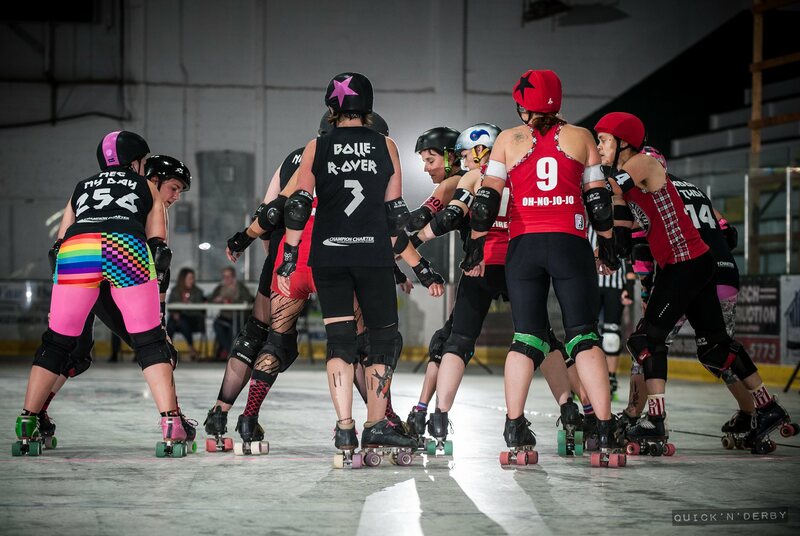 Since the bout, many ladies have stepped forward hoping to join the team. There are no tryouts to be a Maiden; Show up, get your gear, and pass the tests. The last bout of the season will take place at the Hodgins-Berardo arena in Coleraine on October 3rd at 6pm. The Maidens are grateful for your support and hope to see you on the 3rd. The Iron Range Maidens and Attackonites have been blessed for the past several years with an incredible and talented volunteer bout photographer in Wes Bailey. Several months ago, he received a devastating cancer diagnosis. Like many families in this situation, Wes and his wife Courtney are facing some financial challenges, and could use some support. You’ll notice the link at the right side of the page – please consider a donation – even the smallest amount is welcome! My friend Wes and his wife Courtney had been enjoying the good life with their 3 dogs in Grand Rapids, MN when he started having strange symptoms and sensations inside his head during the fall of 2014. Wes saw a doctor at Grand Itasca Clinic who also thought they sounded unusual and potentially serious and ordered an MRI. To everyone’s surprise, it showed a tumor deep in the center of Wes’s brain. A second MRI at the University of Minnesota Medical Center in Minneapolis revealed an additional suspicious area in the left frontal portion. This part was biopsied in December and showed a type of tumor called an astrocytoma with anaplastic features, which is not currently considered a curable cancer. Wes’s case is also more difficult to treat than others because of the locations of the tumor- none of it can be removed. Wes and Courtney have handled this diagnosis with amazing grace, positive attitude, and a determination to “pack lots of love, appreciation, learning, and enjoyment into every single day”. The December biopsy was followed by a long recovery period during which it was difficult for Wes to speak. The first treatment was six weeks of radiation, five days a week, in Hibbing. That did not control new growth completely, so currently Wes is receiving oral and intravenous chemotherapy in Grand Rapids. He and Courtney still need to travel to Minneapolis for MRIs and appointments with his neuro-oncologist. Wes had his first photography exhibit at MacRostie Art Center in downtown Grand Rapids during April 2015. This exhibit showcased the spirit and athleticism of the sport of roller derby. If you missed it, you can see the photos at https://www.flickr.com/photos/wes_bailey/sets/72157652477208475 and can purchase a framed print- just contact Wes. Unfortunately, treatment, subsequent side effects, and the uncertainty of not being able to commit to anything beyond a couple weeks have hindered Wes’s plans to convert his passion and talent for photography into a business. Luckily, Courtney’s job provides good medical insurance and enough flexibility for her to be with Wes at treatments. However, with Wes unable to work they are having trouble getting by on just one income. Medical bills, associated travel, veterinary bills (mostly for their beloved old gal Lula), an upcoming long-overdue septic repair, and assorted other costs have depleted their savings and added additional stress to their life. Everyone who has met Wes and Courtney know what an incredible team they are and can see the love they share for each other, their dogs, family and friends, and the world around them. Any amount you can afford to contribute will be used to offset the unexpected expenses and lost income associated with this diagnosis and will help them reduce their stress and enjoy their time together. Wes and Courtney would like to thank everyone for the love and help they have already received and deeply appreciate all support, financial and otherwise. The Iron Range Maidens held their home opener on Saturday May 30th. 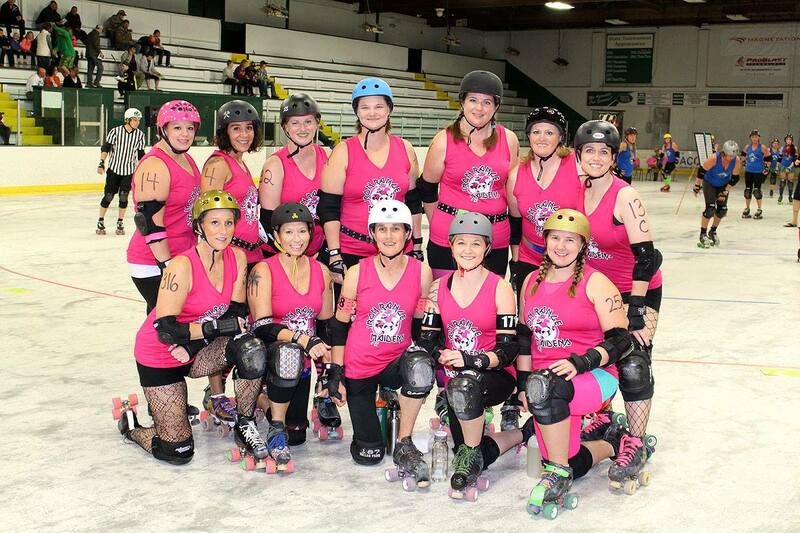 The Maiden’s opponents, the Babe City Rollers of Bemidji, came ready to play. A lot of hard work and preparation went into this bout and they’ll have more to come. The Hodgins-Berardo Arena in Coleraine has become home for the Maidens. The season opener was held there, and the Maiden’s two upcoming home bouts will be there as well. Over 150 people filled the stands on Saturday night to watch the Maidens play the Babes. The Babes came with 7 skaters, 1 of which was a foster skater from Harbor City, Penny Pinch Her. Even with a small roster the Babes proved they were a force to be reckoned with. The Maidens with a roster of 10 were unable to keep the Babes from winning. The bout was full of fast paced skating, big hits, some pile ups, and a close score. The point spread was never more than 21 points. The lead team changed 9 times and the score was tied twice during the bout. The final score was 120 to 140 Babes. Blak n’ Blu Betty had a 14 point jam and Thwaconite had a 12 point jam for the Maidens. Both Nerdzilla and Oh-No-Jo-Jo put up a 19 point jam for the Babes. Maidens’ top scoring jammer for the bout was Martyr Maker with 37 points. Nerdzilla was the top scoring jammer for the Babes with 58 points. It was a great bout for the crowd. The Maidens hope to see more people with each bout. The Iron Range Maidens is a nonprofit organization, whose goal is to strive to positively represent the greater Grand Rapids area by displaying superior sportsmanship, while giving back to the local community. Roller derby encourages women to be active. The Itasca Synchronized Swimming Team was the beneficiary for the bout. They will receive 10% of that bout’s proceeds. Each home bout is put on by the Iron Range Maidens. Everything from laying the track, to advertising, to finding volunteers, to playing a good game is all on the team. Please come show your support for the Maidens on August 29th and October 3rd when they play at the Hodgins-Berardo arena again. Want to help out, try skating, or just want to know what the Maidens are up to? Find them online on Facebook Iron Range Maidens or their website ironrangemaidens.com. 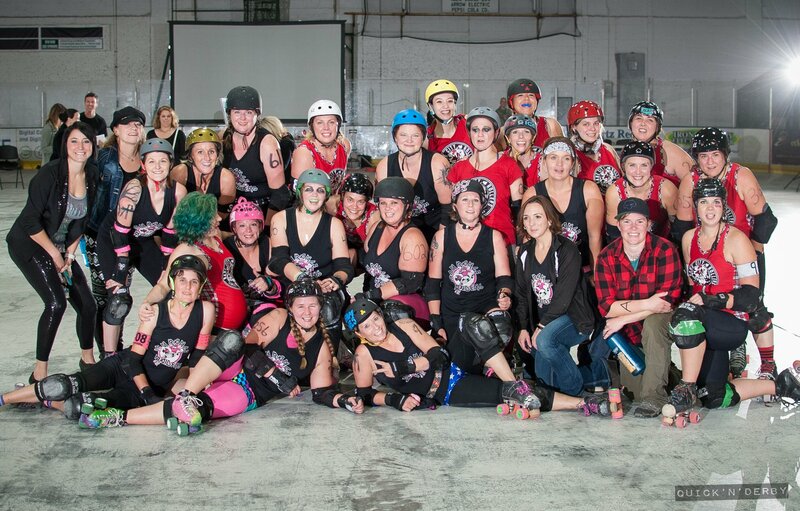 The Maidens would like to thank everyone that helped make this bout possible the fans, volunteers, nsos, refs, and skaters. 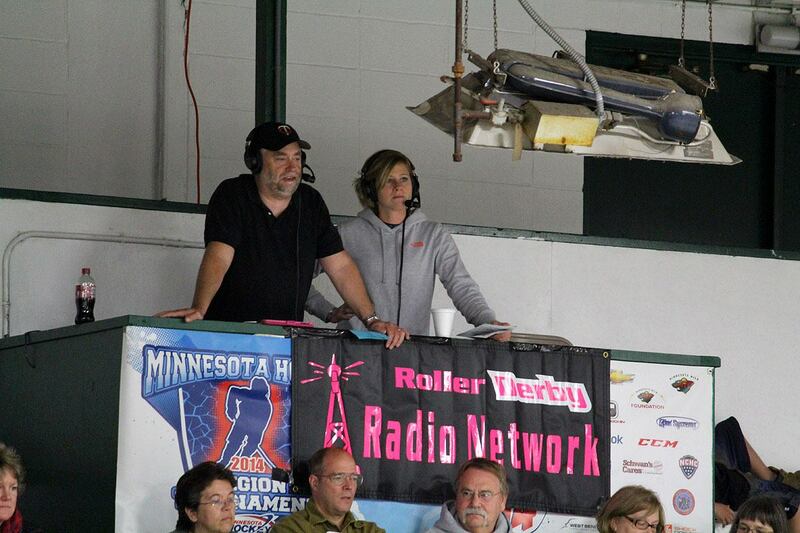 Without all of you Iron Range Maiden roller derby would not be possible. 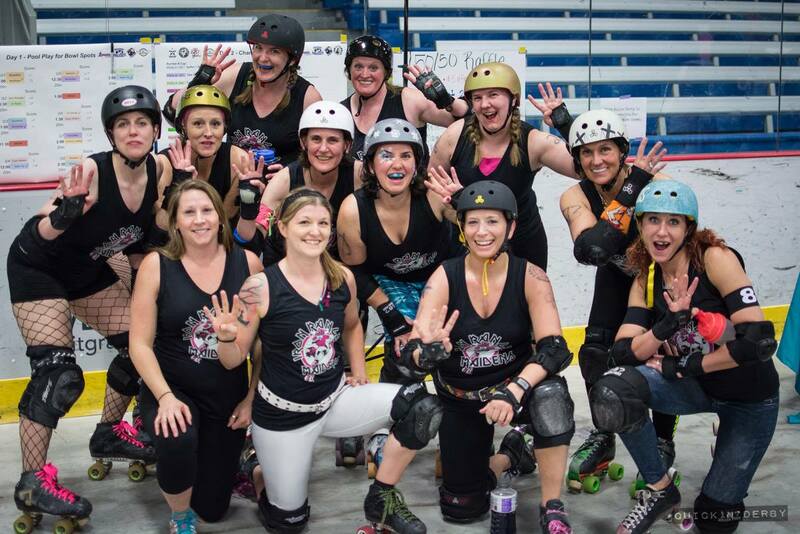 The Iron Range Maidens competed in the 3rd annual Rumble in the Valley Roller Derby Tournament on May 9-10 in Grand Forks, North Dakota. There were a variety of challenging teams in attendance from Winnipeg to Minneapolis. Eight teams participated, and the Maidens placed 4th. The Maidens’ first bout at the tournament was against A-town from Aberdeen, SD. It was a close bout, but we took the win. A-Town is scheduled to come to Coleraine on August 29th for our second home bout of the season. Come see if the Maidens can win again! Bemidji’s Babe City Rollers also attended the tournament. 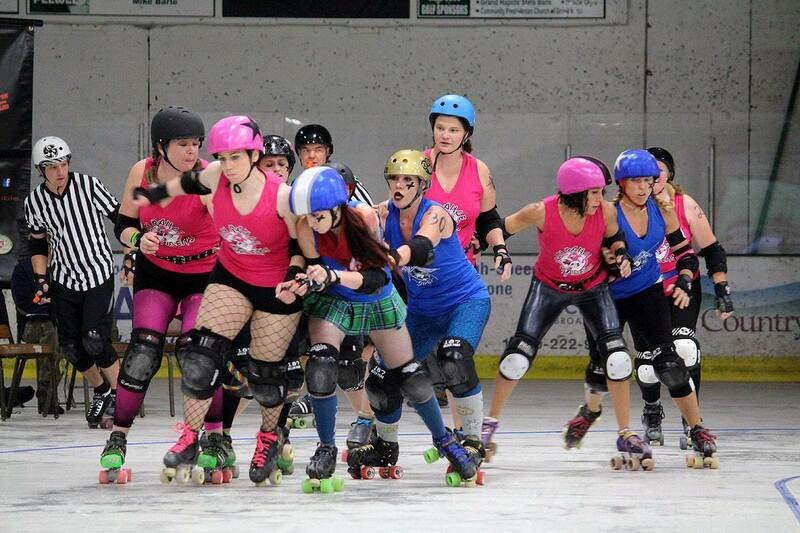 The Maiden’s defeated Babe City in Bemidji back in March. But at the tournament, the Babes were able to pull out the win against us, and ultimately placed first overall. Our home opener on May 30th in Coleraine will determine the season tie breaker. The tournament offered many learning opportunities for the Maidens. We are now focused on preparing for our first home bout of the season on May 30th. We hope to show off all we’ve learned against the Babes at the Hodgins-Berardo Arena. The doors will open at 5:30pm and the first whistle is at 6pm. Tickets are $5 per person; ages 5 and under are free. Don’t miss out on the fastest growing women’s sport in the world!